No matter which type of coffee and espresso maker you are interested in, rest assured that there are good options available at every price range. 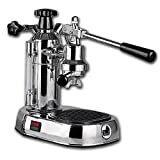 Simply decide which class will work best for you and then look for the best espresso machine within that category. There are many different types of coffee and espresso maker, some of which are quite simple to use. In fact, the most basic can just sit on your stovetop! These are your most basic way to make espresso. They aren’t actually machines, like the ones listed below, because they don’t contain moving parts. Instead, the process is entirely manual, giving you a lot of control over how your coffee tastes. The Bialetti Moka Express Stovetop Espresso Maker is the most popular of these coffee makers, it utilizes a reservoir of water that sits on the stove. The coffee sits on top of that, and is enclosed by a screen on the top and the bottom. The water boils, and the steam goes up through the screen on the bottom. From there, it goes into the coffee and out the screen on top. Then, it is pushed up a small pipe into the top chamber. Eventually, it trickles down into the chamber and stays warm. These espresso makers are easy to use, but you do have to take the time to wait for the water to boil. In addition, some people don’t consider the coffee that comes from these machines as espresso, but merely strong coffee… Read More about how I use my Bialetti Stovetop Coffee Maker (Includes full color photos). These coffee and espresso makers are also known as manual espresso machines, because they require someone to squeeze water through the coffee grounds using a large handle. This human touch is why some people love these machines, and avoid ones that use an electric pump or steam pressure. Depending on the machine, using the lever can be quite easy, or fairly difficult, so you’ll need to make sure you have enough strength before buying one. If you’re a huge fan of espresso, something like the The La Pavoni Europiccola may be the machine for you. Fanatics of the drink say that coffee tastes better when it’s made this way. These machines don’t rely on steam or human sweat to push the water through the coffee grounds. Instead, they have a pump that pushes the water for you. 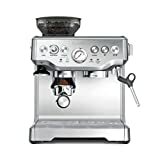 Most of the top espresso machines in this category are electronic, though there are a few that you can operate manually. Because the pump forces the water through the grounds, the liquid doesn’t have to boil before you can get your espresso. This usually makes for a milder, less acidic cup of coffee. Most pod espresso machines and single serve brewers are also pump machines but, instead of using coffee grounds, they use small pods of coffee instead. There are still grounds inside of these, but you don’t have to be bothered with grinding them, and you don’t have to worry about how many grounds you need to make a great cup of espresso. On the positive side, these machines often make decent espresso, since the grounds are pre-measured and made specifically for that purpose. On the negative, there’s no skill involved and you don’t have as much choice in the types of coffee you can buy, since it has to be in pods that fit into your machine. 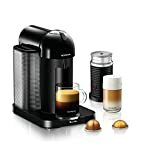 The most popular pod machines are the Nespresso automatics, we actually own one of these and my wife loves it. For her she wants something that’s quick and simple to use and I have to admit it does make a decent coffee. Add to this the fact that Nespresso has the best selection of blends means she can still have fun changing things up a little. Steam espresso machines like the popular Mr Coffee ECM160 are not particularly complicated, and were the first automated way to make espresso. Like the stovetop maker, these coffee and espresso makers use steam and its pressure to force water through the coffee. Different machines work differently when it comes to the details. 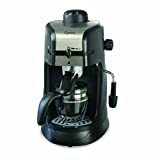 Most inexpensive consumer-level espresso machines are steam machines, and you can often find these sold in conjunction with a normal coffee maker. If espresso is a passion for you, you’ll probably want a higher-level machine than a steam espresso maker. Decide which of the best coffee makers will work for you and then look for the top espresso machines within that category.